Want to start running? It’s a fantastic cardio workout, but if you just wing it, you may find yourself discouraged. Here are three pointers to get you on the right track. Running for the very first time? Here are a few pointers to get you started. People often talk about how running is an inexpensive workout, and it is; but you can’t wear just anything. Those fashion sneakers you wear to the grocery store offer little support. You need a pair of proper running shoes and you want to make sure they fit well and conform to the way your foot hits the ground. You may have a neutral foot or you may over- or underpronate; staff at a specialty running store can help you figure this out. Also, when it comes to clothing, that cotton T-shirt from the last charity drive you fundraised for isn’t going to cut it. You’ll be much more comfortable in proper running apparel. Running apparel has been designed so that it vents as you run and doesn’t chafe your skin; plus, the fabrics used will be sweat-wicking technical fabrics, so you’ll stay much cooler. As with any workout, you want to make sure you are well fuelled before you set out. 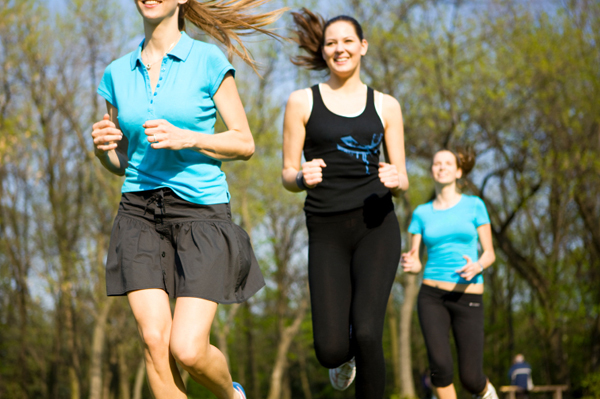 A small snack ( about 100 calories) about a half-hour before you head out is enough energy for your run. Also, be sure to bring water with you and take a sip every 10 minutes or so. Water is fine for runs up to an hour; after that, you will want to consider taking an electrolyte beverage with you. A mistake many novice runners make? Going too fast and/or doing too much, too soon — which will only have you out of breath, discouraged and likely not wanting to tie on those running shoes again. The key when you’re starting out is to take it slowly. Practise walk/run intervals as you build up strength and endurance, beginning with one minute of each and working up to 10 minutes of running and one minute of walking. Regarding pace, you want to be comfortable and able to talk easily with someone. If you’re too out of breath to talk, then you’re going too fast. Once you’ve progressed, you can then focus on doing speed training to improve your pace; but, at the beginning, keep to this slow, steady pace.